Chilean soldiers burn books considered politically subversive in 1973, under Augusto Pinochet's dictatorship. Book censorship is the act of some authority, government or otherwise, taking measures to prevent access to a book or to part of its contents. It can be enacted at the national or subnational level, and can carry legal penalties. Books may also be challenged at a local community level, although successful bans do not extend outside that area. Similarly, religions may issue lists of banned books—a historical example being the Roman Catholic Church's Index Librorum Prohibitorum—which do not always carry legal force. "Almost every country places some restrictions on what may be published, although the emphasis and the degree of control differ from country to country and at different periods." There are a variety of reasons for which books may be banned. Materials are often suppressed due to the perceived notion of obscenity. This obscenity can apply to materials that are about sexuality, race, drugs, or social standing. The censorship of literature on the charge of obscenity appears to have begun in the early 19th century. The rise of the middle class, who had evangelical backgrounds, brought about this concern with obscenity. Governments have also sought to ban certain books which they perceive to contain material that could threaten, embarrass, or criticize them. Throughout history, societies practiced various forms of censorship in the belief that the community, as represented by the government, was responsible for molding the individual. Other leaders outside the government have banned books, including religious authorities. Church leaders who prohibit members of their faith from reading the banned books may want to shelter them from perceived obscene, immoral, or profane ideas or situations or from ideas that may challenge the teaching of that religion. But even religious materials have been subject to censorship. For example, various scriptures have been banned (and sometimes burned at several points in history). The Bible, and other religious scriptures have all been subjected to censorship and have been banned by various governments. Similarly, books based on the scriptures have also been banned, such as Leo Tolstoy's The Kingdom of God Is Within You, which was banned in the Russian Empire for being anti-establishment. Banning of a book often has the effect of making people seek the book. The action of banning the book creates an interest in the book which has the opposite effect of making the work more popular. 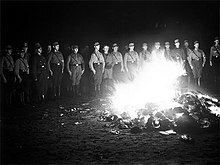 Nazi Germany burned works of Jewish authors, and other works considered "un-German". ^ "CENSORSHIP OF BOOKS". teara.govt.nz. ^ "About Banned & Challenged Books". ala.org. ^ a b University of South Florida. "USF NetID Single-SignOn - University of South Florida". usf.edu. ^ "Banned Books Online". upenn.edu. ^ a b "Mock Book Burning Elicits Strong Feelings". ^ "Index Librorum Prohibitorum". Encyclopædia Britannica Online. ^ University of South Florida. "USF NetID Single-SignOn - University of South Florida". usf.edu. ^ a b "Could Banning Books Actually Encourage More Readers?". NPR.org. 20 September 2013. ^ a b "Free Speech". ^ a b "Civil Liberties". Haight, Anne (1970). Banned books informal notes on some books banned for various reasons at various times and in various places (3d ed.). New York: R.R. Bowker. ISBN 978-0-8352-0204-6. Edwards, M. J. (2017). Christianity, Book-Burning and Censorship in Late Antiquity. The Journal Of Ecclesiastical History, 68(4), 825-827. Neilson, W. A. (1930). Is Official Censorship of Books Desirable? CON. Congressional Digest, 9(2), 56-57. Wikimedia Commons has media related to Book censorship. This page was last edited on 17 April 2019, at 14:09 (UTC).